Looks cool and I’m interested in trying out your temp control because that’s all I use. Testers Announcement! 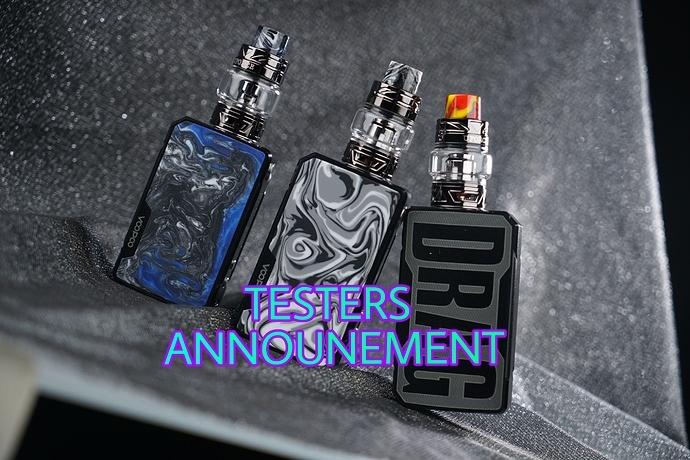 Super excited to announce 6 Testers here to test the NEW Drag 2/Mini. Everyone entered thank you so much. Pls PM your shipping info asap ( Full name, address, post code, country, tel number). You’ll receive Drag 2 or Drag Mini randomly. Pls make sure you’ll post review on time, in 1 week after receiving the products. Pls share the review to us so we can know review done. Thanks. Congratulations to @cosmic, @SunnyT, @Laura5, @Vaporraven, @adary and @Sprkslfly, I’m looking forward to reading your reviews. Thank you @VOOPOOTech for the chance to review the new Drags. Some of my favorite peeps get to do a review. Woo Hoo. !!! Congrats @Cosmic, @Laura5, @Vaporraven, @adary, and @Sprkslfly! Hope you all are as excited as I am to review one of these new devices! Thanks @VOOPOOTech for this opportunity, and I also wanted to point out and say thank you for choosing 6 of our forum members as testers! Thanks everybody!!! This is gonna be so fun! Yes, I agree that this is gonna be fun! I think I will enjoy reviewing one of these mods! Congratulations @adary @Cosmic @Laura5 and @Sprkslfly ! Big Congrads to all of you winners, tbt127, Laura5, VaporRaven, Adary and Sprksfly. This is definately going to be interesting and very cool to read all of your reviews. This is definately going to be interesting and very cool to read all of your reviews. I agree. It is a weird approach but maybe it is to see the diversity of all the winners. Writing style and what not. I’m bummed because @SmilingOgre (Walt) did not get chosen. You probably will receive a shipping confirmation via dhl tomorrow, as well as a link or copy/paste of that number via email/pm. That’s how it was for me last time, since most of these packages get express shipped. (2day max). All the sudden I got a email saying : " hi xxxx, a package is scheduled for delivery tomorrow " by dhl lol. Nope have not heard anything.